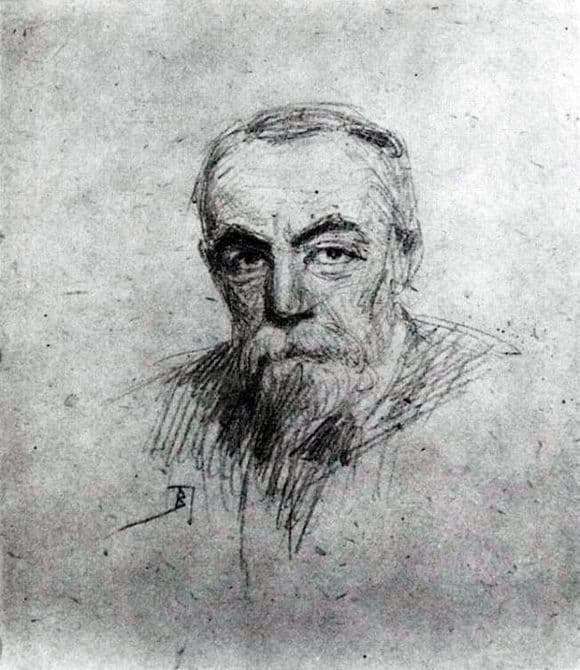 “Self-portrait” is dated 1901. Vasily Dmitrievich Polenov is about sixty years old on it. This man was gifted with many talents and was interested in various fields of art. V. Polenov was a pioneer, undertaking the study and development of those areas that were considered to be not worth the attention of the fundamental master. As a result of such research, the painter favored the formation of a new type of unique artists and, as can be observed in the modern world, a new style and trends in art. The drawing accurately conveys the face of a richly spiritualized modest person. A tenacious gaze, even without paints, conveys the wisdom of a brilliant master who entered the history of art as a “poet of painting”. He opened the intimate atmosphere of patriarchal estates and the joyful pacification of everyday life, the attractiveness of landscapes of native places and the colorful colorful splendor of the East. An invaluable contribution on the part of V. Polenov will be the development of plenerism, giving its contemporaries new artistic horizons, captivating with their “freshness” and abundance of methods for translating their designs and moods. V. Polenov was deeply convinced that art should carry grace and ecstasy, otherwise it is meaningless. His duty as an artist, he saw in the aesthetic enlightenment of society, the opportunity to learn and touch the bright and beautiful, that fills life with meaning and inner beauty.